In his state of the union speech, President Obama called for talks on a large-scale free trade agreement with the European Union as a way to help strengthen the American economy. 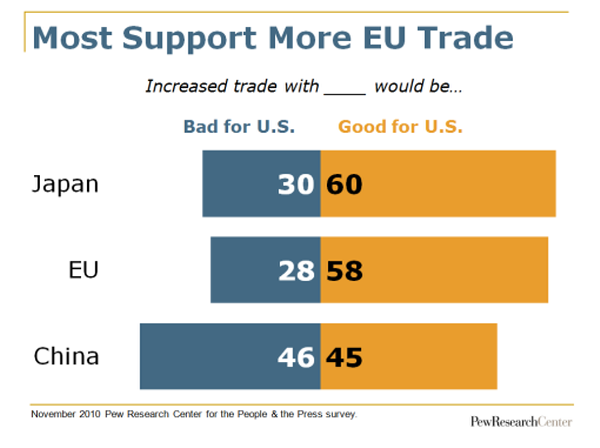 The idea of increased trade with the EU nations has had strong public support. In a late 2010 survey, 58% of Americans said more trade with those nations would be good for the United States. Just 28% said it would be bad for the U.S.
At that time, most Americans also said that increased trade with Canada and Japan – as well as India, Brazil and Mexico – would be good for the United States. For example, 60% said increased trade with Japan would be good for the U.S. Reactions were more mixed to increased trade with South Korea and China. Roughly equal numbers said increased trade with China would be good (45%) or bad for the U.S. (46%).